Hot Cross Buns are traditionally associated with the celebrations of Easter. The spiced, raisin-studded buns are made with eggs and butter, which Christians were forbidden to eat during the 40 days of Lent, and were usually eaten for breakfast on Good Friday. The white cross on the top of the buns is said to represent the crucifixion. These days, hot cross buns are very popular and can be found in the supermarkets almost the whole year round. Most people buy them and have them toasted for breakfast or tea, but they are easy to make and give off a most delicious, inviting, homely smell when baking. So pick a spare afternoon and try your hand at making an old English favourite. I promise that your family will love you forever! 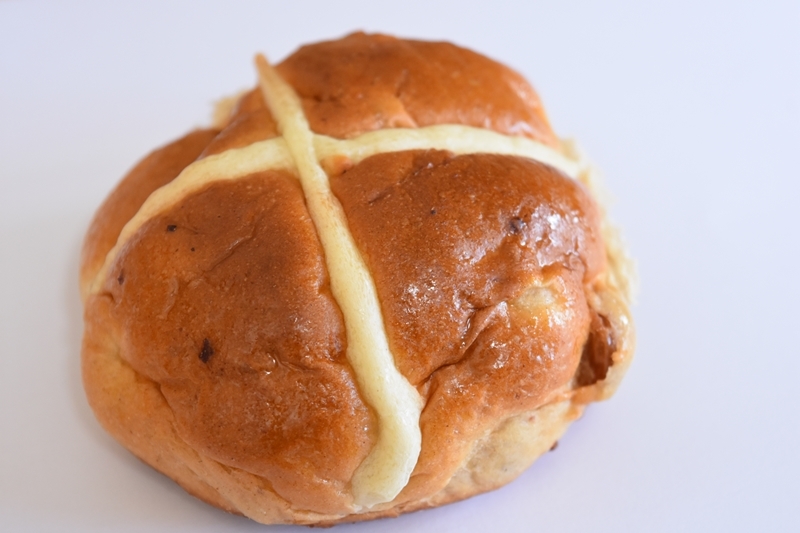 You can find two different Hot Cross Bun recipes below. One is the traditional one for hand baking and makes about 16 buns. But the buns can be made very successfully using a bread maker, so I'll give you a recipe for that as well. It makes about 8 buns, but can be easily doubled. The bread machine mixes and raises the dough for you, all you have to do is shape the buns, decorate them and put them in the oven to bake! Mix the yeast, sugar and milk in a bowl until the yeast has completely dissolved. Leave the bowl - covered - in a warm place until the mixture is frothy. This should take about 10-15 minutes, depending on how warm your kitchen is. In a large bowl, combine the flour with the cinnamon and mixed spice, then rub in the butter until well incorporated. Add the yeast mixture, egg, water and fruit and combine well. Cover and leave to rest in a warm place for about 1 hour or until the dough has doubled in size. Turn the dough out onto a floured board and knead until smooth, then divide into 16 portions. Shape the dough into buns, place onto a greased baking tray, cover and leave to rise for 20 minutes. While the dough rests, mix 2 tbsp of flour, 3 tbsp of water and 1 tbsp of caster sugar into a smooth paste. When the dough is well risen, pipe or paint crosses onto the buns. Bake the buns in a medium oven for about 25 minutes until golden, then glaze with warm apricot jam or sugar glaze. I have only very few gadgets in my kitchen, but my Breadmaker from Panasonic is one of my favourites. It's been in almost daily use since I bought it and I would not part with it. It makes all manner of bread - obviously - but also makes short work of pizza dough, buns, fruit bread and cakes. 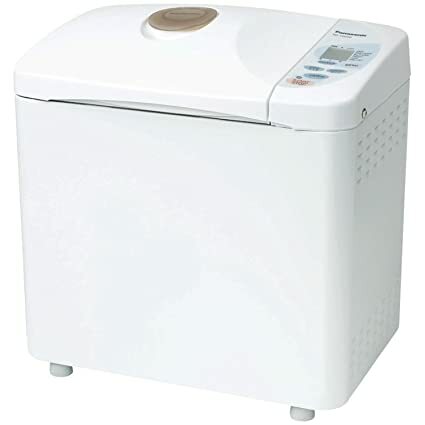 If you like fresh bread and cakes, but are a bit short of time or a little unsure about your baking skills, a bread maker is a good way to go. Making Hot Cross Buns in a bread machine is simply a doddle. Add all the ingredients for the dough into the pan of the bread maker. Put the raisins or sultanas in the raisin/nut dispenser. Select the Raisin dough program. Then sit back and wait for the beep that tells you the dough is ready. Turn it out, knead briefly and shape into buns. Put these on a greased baking tray, cover and leave to rise for 20 minutes before piping a cross on top (as explained above). Bake for about 25 mins, then glaze. 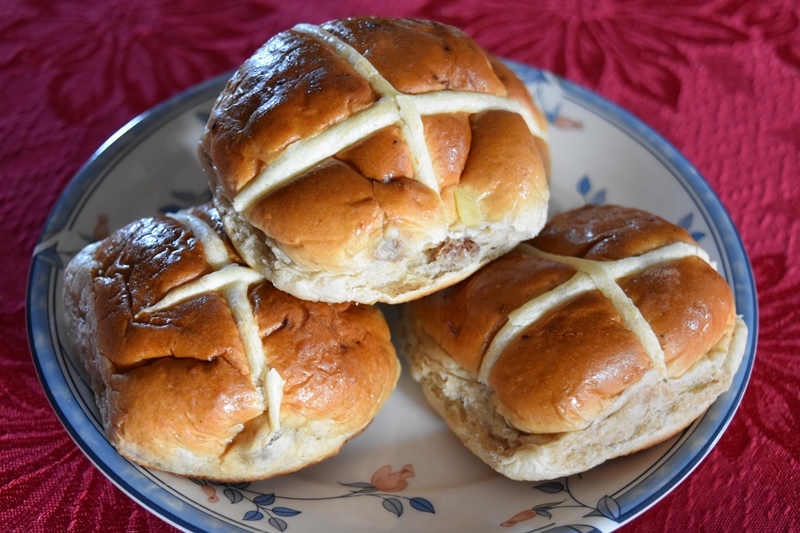 For more teatime treats, return from Hot Cross Buns to the recipes page.